YOU WILL NOT BE ABLE TO PLACE AN ORDER UNTIL YOU HAVE ENABLED SCRIPTING IN YOUR BROWSER. If you are having problems, please call us on (Local) 021 6718399 (International) +27 21 6718399 for assistance. Flower deliveries to all suburbs and areas around South Africa & Africa. Fresh flowers directly from the farms. Phone us now for customised arrangements. Prompt deliveries daily. 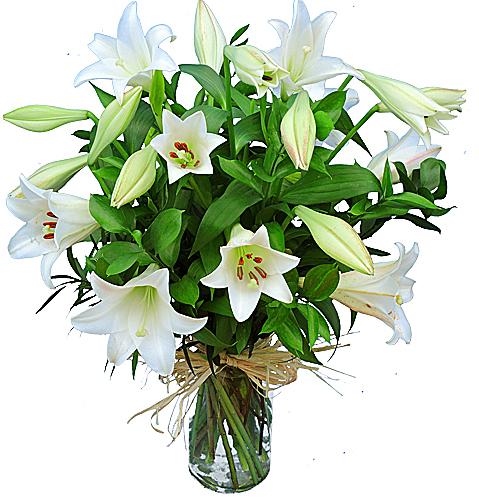 WIN THIS BEAUTIFUL VASE OF LILIES ! During the checkout process, there will be a chance to enter the lucky draw. Stand a chance to win this beautiful vase of St Joseph lilies to be delivered to any address in SA on any date during 2019. Entries close midnight (South African time) Wednesday, 29 May. The lucky sender/winner will be informed on Thursday, 30 May. The Winner(Sender) will be able to select any delivery date and address in SA during 2019, ALL FREE OF CHARGE. WE DELIVER SAME DAY TO ANY ADDRESS IN SOUTH AFRICA AND MOST CITIES IN OTHER AFRICAN COUNTRIES. WE DELIVER SAME DAY TO ANY ADDRESS IN South Africa & Africa. Orders must be received by 13h00 (CET) for guaranteed same day deliveries, however, same day deliveries may still be possible for orders received after 13h00. We will let you know if we are unable to deliver your order on the same day. We deliver daily during office hours and on Saturdays. Orders must be received by 12h00 on a Saturday for same-day deliveries. Some deliveries only take place in the afternoon. Please be patient. Sunday and public holiday deliveries are also possible as some of our florists are open for business. However, if we are unable to deliver on the Sunday or Public holiday, then we will get in touch with the recipient to forward your message and make suitable delivery arrangements when we re-open shop. There is a possibility that we might have to contact the recipient to make suitable arrangements for delivery. Please note that our florists in small or remote areaswe may need to substitute colour or cuts of flowers, especially if you order at short notice. Should nobody be home at time of delivery, we will make contact with the recipient and make suitable delivery arrangements. In this instance the appearance of the arrangement might differ from the picture on the website. Most flowers on our catalogue are available all year round. Some containers and cuts of flowers and colours might be unavailable at short notice, especially in smaller towns and remote areas, in which case we will substitute the best we can. In this instance the appearance of the arrangement might differ from the picture on the website. There is a possibility that your order might be delayed in case of power outages. NB: FOR PAYMENT CONFIRMATIONS OR PAYMENT QUERIES, CONTACT ACCOUNTS DEPARTMENT. NB: Do not phone these numbers to enquire about placing orders or to enquire about the status of your order placed. The staff at these numbers only deal with accounts. Credit Card Credit Card Payments are handled through the secure Mygate payment gateway. Click VERIFY should you wish to check that we are a secure merchant. Alternatively phone us with your card details if you experience a problem. Direct Deposit We accept cash deposits and internet bank transfers into our South African FNB account or our UK HSBC account. Our bank details will be provided during the ordering system should you choose this payment option. In the case of a cash deposit or internet transfer it is important to email or fax us confirmation of your deposit. Vouchers Any discounts/voucher details will be requested and applied at the end of the checkout process. BE ASSURED YOU WILL RECEIVE CONFIRMATION OF YOUR ORDER DIRECTLY AFTER PLACING IT. Should there for any reason be a delay in the confirmation, send an email to info@floraniche.co.za with the order number and your name.